A STROKE, SOMETIMES REFERRED TO AS A CEREBROVASCULAR ACCIDENT (CVA), CEREBROVASCULAR INSULT (CVI), OR BRAIN ATTACK IS THE LOSS OF BRAIN FUNCTION DUE TO A DISTURBANCE IN THE BLOOD SUPPLY TO THE BRAIN. THIS DISTURBANCE IS DUE TO EITHER ISCHEMIA (LACK OF BLOOD FLOW) OR HEMORRHAGE. AS A RESULT, THE AFFECTED AREA OF THE BRAIN CANNOT FUNCTION NORMALLY. HEMORRHAGIC STROKE: are less common, in this condition blood spills into or around the brain due to weakened blood vessel leak and creates swelling and pressure, damaging cells and tissue in the brain. 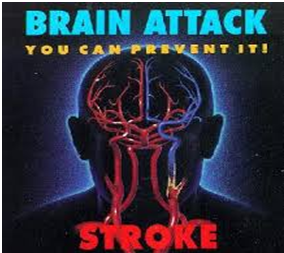 ISCHEMIC STROKE: occurs when a blood vessel carrying blood to the brain is blocked by a blood clot. This causes blood not to reach the brain. High blood pressure is the most important risk factor for this type of stroke. TRANSIENT ISCHEMIC ATTACK (TIA): It occurs when blood flow to part of the brain stops for a short period of time; it can mimic stroke-like symptoms. These symptoms appear and last less than 24 hours before disappearing. While TIAs generally do not cause permanent brain damage, they are a serious warning sign that a stroke may happen in the future and should not be ignored. MYTH: Stroke cannot be prevented. FACT: Up to 80 percent of strokes are preventable. MYTH: There is no treatment for stroke. doctor immediately. Treatment may be available. MYTH: Stroke only affects the elderly. MYTH: Stroke happens in the heart. FACT: Stroke is a "brain attack". MYTH: Stroke recovery only happens for the first few months after a stroke. MYTH: Strokes are not hereditary. MYTH: If stroke symptoms go away, you don't have to see a doctor. called transient ischemic attacks (TIA). stroke and need to be taken seriously. Knowing the signs and symptoms of a stroke is the first step to ensure medical help immediately.For each minute a stroke goes untreated and blood flow to the brain continues to be blocked, a person loses about 1.9 million neurons. This could mean that a person's speech, movement, memory, and so much more can be affected. Learn as many stroke symptoms as possible so you can recognize stroke FAST and save a life! Effective treatment of stroke can prevent long-term disability and save lives.The specific treatments recommended depend on whether a stroke is caused by a blood clot obstructing the flow of blood to the brain (ischemic stroke) or by bleeding in or around the brain (hemorrhagic stroke). 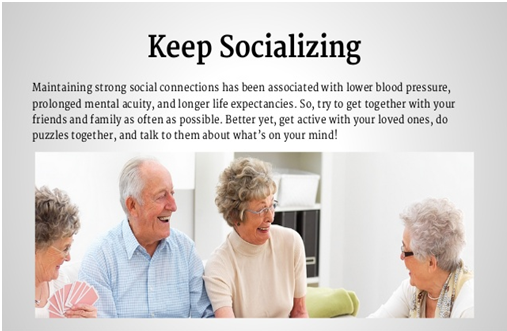 Treatment will usually involve taking one or more different medications, although some people may also need surgery. Emergency treatment with medications. 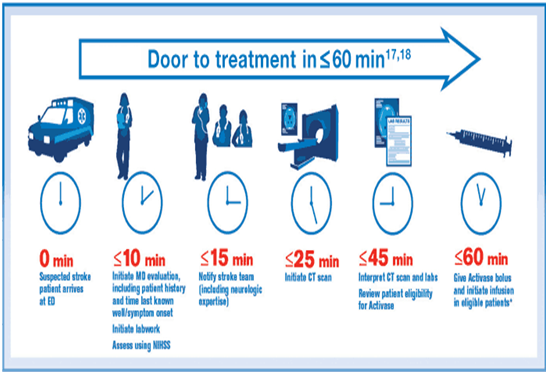 Therapy with clot-busting drugs must start within 3 to 4.5 hours if they're given into the vein and the sooner, the better. Aspirin: Aspirin is an immediate treatment given in the emergency room to reduce the likelihood of having another stroke. Aspirin prevents blood clots from forming. Medications delivered directly to the brain. Doctors may insert a long, thin tube (catheter) through an artery in your groin and thread it to your brain, and then release TPA directly into the area where the stroke is occurring. Minimally invasive mechanical clot removal: Doctors may use a catheter to maneuver a tiny device into your brain to physically break up or grab and remove the clot. Emergency measures. If you take warfarin (Coumadin) or anti-platelet drugs such as clopidogrel (Plavix) to prevent blood clots, you may be given drugs or transfusions of blood products to counteract these blood thinners' effects. 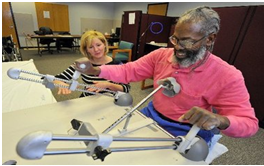 Most stroke survivors receive treatment in a rehabilitation program. In addition to the treatments mentioned above, you may also need further short-term treatment to help manage some of the problems that can affect people who have had a stroke. Strokes are usually diagnosed by carrying out physical tests and studying images of the brain produced during a scan. A number of tests can then be carried out to help confirm the diagnosis and determine the cause of the stroke. This may include blood tests to determine your cholesterol and blood sugar levels, checking your pulse for an irregular heartbeat and taking a blood pressure measurement. TIME: If you observe any of these signs, call your doctor immediately. Different treatment is required for the different types of stroke, so a rapid diagnosis will make treatment more straightforward. 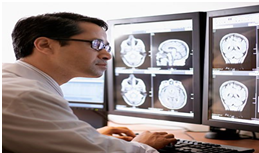 A CT scan is like an X-ray, but uses multiple images to build up a more detailed, three-dimensional picture of your brain to help your doctor identify any problem areas. 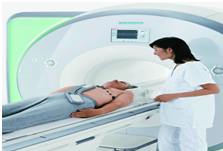 An MRI uses a strong magnetic field and radio waves to produce a detailed picture of the inside of your body. A swallow test is essential for anybody who has had a stroke, as swallowing ability is commonly affected early after a stroke. Further tests on the heart and blood vessels might be carried out later to confirm what caused your stroke. Some of the tests that may be carried out are described below. A carotid ultrasound scan can help show if there is any narrowing or blockages in the neck arteries leading to your brain. In some cases another type of ultrasound scan called an echocardiogram may be carried out to produce images of your heart and check for any problem with it that could be related to your stroke. The injury to the brain caused by a stroke can lead to widespread and long-lasting problems. What are the Risk factors for Stroke ? Previous Stroke or Transient Ischemic Attack. High Blood Pressure: People who have high blood pressure have one and a half times the risk of having a stroke compared to those who consistently have optimal blood pressure of 120/80. High Cholesterol level: High cholesterol in the arteries can block normal flow to the brain and cause a stroke. Total cholesterol levels under 200 are recommended. Heart Disease: One of the major circulation problems is atherosclerosis, progressive fatty deposits in the arteries that cause hardening and buildup of cholesterol plaque. Diabetes Mellitus: People with diabetes are up to four times more likely to have a stroke than people who don't. ATRIAL FIBRILLATION: Heart condition called atrial fibrillation is a type of irregular heartbeat, more common in people 65 years and older. Atrial fibrillation raises stroke risk because it allows blood to pool in the heart. When blood pools, it tends to form clots which can then be carried to the brain, causing a stroke. Sickle Cell Disease: The disease causes some red blood cells to form an abnormal sickle shape. A stroke can happen if sickle cells get stuck in a blood vessel and block the flow of blood to the brain. Unhealthy Diet: Diets high in saturated fats, trans fat, and cholesterol have been linked to stroke and related conditions, such as heart disease. Also, too much salt (sodium) in the diet can raise blood pressure levels. Physical Inactivity: Not getting enough physical activity can increase the chances of having other risk factors for stroke, including obesity, high blood pressure, high cholesterol, and diabetes. Regular physical activity can lower your risk for stroke. Obesity:is excess body fat. Obesity is linked to higher "bad" cholesterol and triglyceride levels and to lower "good" cholesterol levels. In addition to heart disease, obesity can also lead to high blood pressure and diabetes. Too Much Alcohol: Drinking too much alcohol can raise blood pressure levels and the risk for stroke. It also increases levels of triglycerides, a form of fat in your blood, which can harden your arteries. Tobacco use increases the risk for stroke. Cigarette smoking can damage the heart and blood vessels, which increases your risk for stroke. Also, nicotine raises blood pressure, and carbon monoxide reduces the amount of oxygen that your blood can carry. Exposure to other people's secondhand smoke can increase the risk for stroke even for nonsmokers. Women experience more strokes each year than men, mainly because women live longer than men and stroke occurs more often at older ages. Family History: Your stroke risk increases if a family member (parent, grandparent, or sibling) has had a stroke or a heart attack at an early age. Age: After the age of 55, stroke risk doubles for every decade a person is alive. Age is the single most important risk factor for stroke. The older you are, the more likely you are to have a stroke. A patient is often overwhelmed by the number of stroke rehab exercises especially after being in the hospital for acute phase and inpatient rehab center. 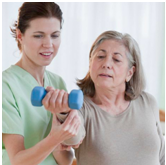 Below is a list of various types of stroke rehab exercises. Active Assistive Range of Motion (AAROM) : This type of range of motion occurs when a weak limb is assisted through movement. Active Assistive Range of Motion (AAROM): This type of range of motion occurs when a weak limb is assisted through movement. Active Range of Motion (AROM) : This occurs when a person can move a body part on their own without assistance. Strengthening or Resistance Training Stroke rehab exercises often consist of strengthening activities that involve moving a body part against resistance. This type of exercise will gradually and progressively overload the muscles so that they will get stronger. There are many types of strengthening exercise equipment including bands, dumbbells, tubing, putty, and exercise machines. Stretching Exercises Muscles often become tight or have tone after a stroke. Stretching on a regular basis can help prevent joint contracture and muscle shortening. Weight Bearing Exercises: Weight bearing can help reduce excessive tone brought on by a stroke and strengthens weak muscles. Scapular mobilization exercises: help move or mobilize the scapula in order to maintain or improve shoulder range of motion and prevent pain. Soft diets for stroke patients. It is important to make it as easy as possible for a stroke patient to eat in order to prevent malnutrition and anorexia. Regular walking helps improve stroke survivors' physical fitness, mobility and quality of life, according to a new study. Some stroke survivors struggle with communication, Efforts at language impaired when function has to shift to the right side of the brain, researchers say. Loss of function of any part of the body can make eating, chewing, and swallowing of food difficult or even impossible in stroke survivors. A person recovering from STROKE will require close monitoring of their nutritional status in the acute and rehabilitation phase. If a person's oral intake is poor, then they will need to be supplemented with liquid formulas or to explore food habits and preferences to encourage a person to eat through consistency of food and planning a balanced diet. 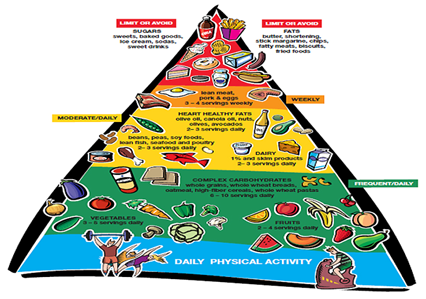 The speech therapist and dietician will be able to determine the appropriate modified consistency of food (i.e. blended, soft and moist or easy chew) and fluids (i.e. pudding, honey, nectar or thin) of a person Planning a balanced diet is important to allow adequate nutrition for the recovery in a person with TBI. The table below will be a guide to choosing and planning meals from the four major food groups. Post-hospitalisation, many patients experience poor appetite. To boost your appetite, consume small portions of food about 7-9 snacks/meals throughout the day. Nausea is another common complaint that could be caused due to medications. Take the prescribed medicines on full stomach. Consult your doctor if nausea persists. 1. Include lots of fresh, seasonal, local and if possible organic Fruits and Vegetables in your daily diet. 2. Add plenty of Whole Grains (whole wheat flour, brown rice, whole beans). 3. Choose foods high in Good Fat such as olive oil, peanut oil, fatty fish, walnuts, flaxseeds. If you do not eat fish, talk to your doctor about taking fish supplements. 4. Instead of whole milk, choose low fat or skim milk. 5. Include food sources rich in Magnesium and Potassium to increase heart health. 1. Say NO to all Sugary and Refined foods (cakes, pastries) and do not add any sugar to beverages. 2. Avoid Unhealthy Fats such as Cholesterol, Saturated and Trans Fat. Stay away from egg yolks, cream, butter, ghee, coconut, deep fried items, whole milk, dalda, vanspati. 3. No Carbonated, Caffeinated and Alcoholic beverages. 4. Curb Salt intake, as it can increase blood pressure. Don't add salt while cooking and reduce packaged food consumption. Talk to you doctor or dietician about any restrictions on fluid or water intake. Do not add SALT or SUGAR while cooking or as seasoning. For cooking, use only Olive Oil.